On September 24, 2014, India become the fourth country, after the U.S., the erstwhile U.S.S.R and the European Space Agency, to reach Mars. Following a ten-month-voyage from the Earth, the Mars Orbiter Mission (MOM), or Mangalyaan, finally entered the Red Planet’s orbit, making India the first Asian nation to achieve such a feat. It has recently captured a series of spectacular 3D images of what is likely the largest canyon in the entire solar system. 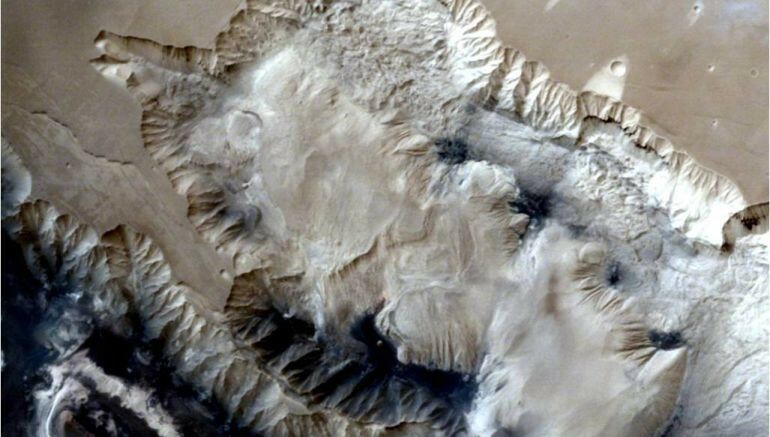 According to the Indian Space Research Organization (ISRO), the photos, taken on July 19, show the Ophir Chasma, a Martian canyon located in the planet’s Coprates quadrangle. Measuring up to 317 km (nearly 197 mi) in length and around 8 to 10 km (5 to 6 mi) in depth, the incredibly steep Ophir Chasma contains several floors, each of which is made up of vast deposits of layered materials, such as sulfates. It is part of the enormous Valles Marineris, which is commonly believed to be the largest canyon system in the entire solar system. 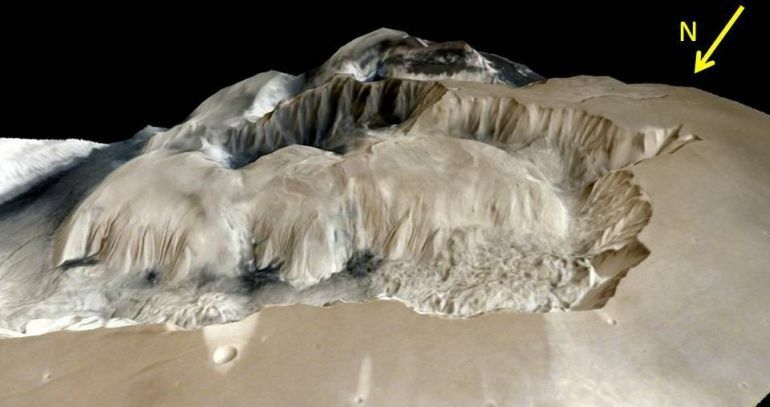 Discovered in the early 1970s by the Mariner 9 Mars orbiter, Valles Marineris extends up to 4,000 km (around 2,500 mi) across the planet’s surface, and is about 200 km (or 120 mi) wide and 7 km (4.3 mi) deep. Its length is almost equal to the total horizontal width of the United States, and it is nearly 9 times longer, 7 times wider and even 4 times deeper than the Grand Canyon in Arizona. 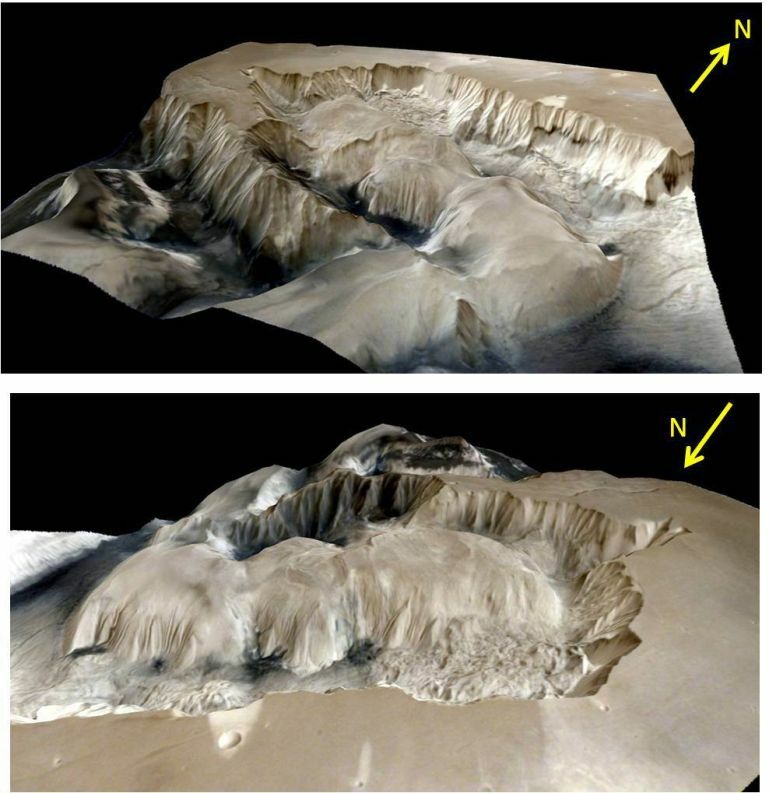 Although scientists are still uncertain as to how such a rift could have formed on the Martian crust, studies have shown that the eastern parts of the gorge may have been created by water flowing on Mars’ surface. The images were captured from an altitude of around 1857 km (approx. 1154 miles), using the Mars Color Camera (MCC) on board the $73 million Mars Orbiter Mission. The probe is part of a project, undertaken by ISRO, that aims at developing more advanced, and efficient, technologies for future space missions. Its tasks include testing orbit manoeuvrability, navigation and power and communications systems of a spacecraft, during an interplanetary voyage. Furthermore, it contains five specially-designed instruments that are in turn capable of studying Mars’ surface as well as its atmosphere.